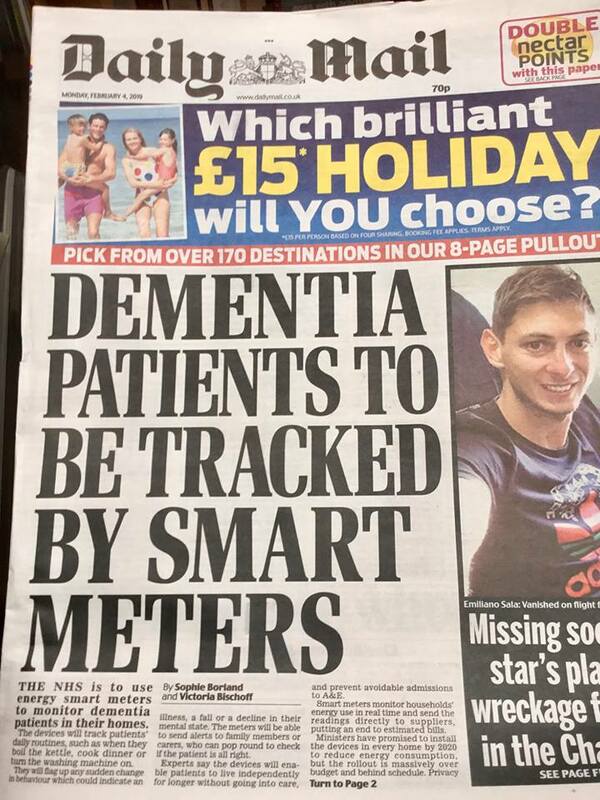 SMART meters are going to be used by the NHS to help and monitor dementia patients in their own homes. It is thought that the devices will be able to track their daily routines such as cooking dinner or boiling the kettle. The tech will be able to flag up any sudden differences in the routine which could indicate that the person has fallen, become ill or had a decline in their mental state. They will then be able to alert a family member or carer who will then attend the address of the patient to check on their welfare. The NHS trial will start this year following initial research by computer science experts at Liverpool John Moores University. A six month observation trial was launched for the technology in 2017, and a more extensive trial of 50 patients is being launched by the University and Mersey Care NHS Foundation Trust. Experts claim that the devices could prevent admissions to A&E and also allow patients to live an independent life for longer without going into care homes. Smart meters provide us new information to visualize, analyze, and op-timize the energy consumption of buildings, to enable demand-response optimiza-tions, and to identify the usage of appliances. They also can be used to help older people to stay longer independent in their homes by detecting their activity and their behavior models to ensure their healthy level. This paper reflects methods that can be used to analyze smart meter data to monitor human behavior in single apartments. Two approaches are explained in detail. The Semi-Markov-Model (SMM) is used to train and detect individual habits by analyzing the SMM to find unique structures representing habits. A distribution of the most possible executed activity (PADL) will be calculated to allow an evaluation of the currently executed activity (ADL) of the inhabitant. The second approach introduces an impulse based method that also allows the detection of ADLs and focuses on temporal analysis of parallel ADLs. Both methods are based on smart meter events describing which home appliance was switched. Thus this paper will also give an overview of popular strategies to detect switching events on electricity consumption data. As we get older it becomes easier to neglect our health. As we age we increasingly fail to notice the small changes in our lives that can indicate a more serious condition further down the line. But what if our energy use could help us spot these changes and diagnose issues earlier? Every few seconds, households in the UK share data with their energy supplier, showing spikes in energy use. With the rise of smart meters, we are now able to track this usage down to an individual device, and the data, if read the right way, is able to tell us (for example) the last time the kettle was boiled. This wealth of information is already being gathered by the likes of EDF and British Gas but it can be utilised to tell us so much more about our health. Our energy use can easily draw a picture of our daily routine, from the time we get up to when we cook in the evening, and this insight can be critical in identifying subtle changes to our routine. As we get older, changes in our behaviour tends to be gradual and difficult to spot, but by accessing data which is already being taken, we can track these changes in an unobtrusive way. With 3.5 million people living alone aged over 65, there is a much higher risk of gradual changes going unnoticed, with the first sign of an issue often only coming to light after something drastic happens, such as a fall. Monitoring systems can learn routines over time, and start to distinguish when changes are one offs or a reoccurring issue. While they cannot identify specific health issues, the information can be utilised by health professionals to help them come to a diagnosis more quickly. Signals such as getting up later, using devices in the night, or kitchen appliances going un-used, can help raise red flags before a situation becomes serious. These monitoring systems will alert the individual of the changes and encourage them to have further conversations with their family and health team, rather than simply dismissing them as ‘old age’. Conditions which could be identified by these signals include arthritis, and the early stages of dementia and insomnia. For prioritised cases we also have the option of maximising this data by adding more data points and bringing in other technology. Conditions such as Chronic Obstructive Pulmonary Disease (COPD), which effects nearly two per cent of the population, can be better monitored by combining the data with additional sensors and advanced medtech. Interactive weighing scales can help identify a decline in certain heart conditions while home blood oxygen measurements can help those living with COPD to stay independent. By giving individuals ownership of their data, they can become better informed about their health, and even use it to aid conversations with doctors and other health professionals. Rather than visiting a doctor and trying to describe the history of the presenting condition, individuals can take their data, from over a period of time, to demonstrate how long it has been going on for. This saves time and resource for both the doctor and the patient. With these advancements, it is important to remember that technology is still not designed to replace doctors and trained health professionals and should rather be used to encourage people to have open conversations about their health, especially as they get older. Early intervention for the vulnerable who are otherwise healthy and active through unobtrusive steps is a great way to prevent bigger issues emerging and helps to free up the already strained NHS. This entry was posted on February 4, 2019, 10:53 am and is filed under England, Europe, Smart Meter, surveillance, tracking. You can follow any responses to this entry through RSS 2.0. You can leave a response, or trackback from your own site.